The following are the contributors for EVENT 46/1. RICHARD ALI is Nigerian. His work has been published in African Writing, Saraba Magazine and elsewhere. He has served in the National EXCO of the Association of Nigerian Authors, sits on the board of Uganda’s Babishai Niwe Poetry Foundation and is a member of the Jalada writers’ collective. His debut poetry collection is forthcoming (2017). He practises law in Abuja. KATE BRAID has published a dozen books of non-fiction and prize-winning poetry. After a checkered career that included 15 years in construction, she settled into writing and teaching at UBC, SFU and Vancouver Island University, where she came to love the engagement and exhilaration of teaching, in spite of having to mark. She’s at www.katebraid.com. MÉIRA COOK’s most recent novel is Nightwatching (HarperCollins Canada, 2015) and her most recent volume of poetry is Monologue Dogs (Brick Books, 2015). ‘My Holocaust Survivor’ is an excerpt from her forthcoming novel-in-stories, Once More with Feeling, which will be published by Anansi in Fall 2017. TREVOR CORKUM’s fiction, nonfiction, essays and reviews appear frequently across Canada. He was a finalist for the 2016 National Magazine Award for Fiction (for ‘Dar a Luz,’ EVENT 44/2), and has appeared in the Journey Prize anthology. He runs a popular author interview series called The Chat on 49thShelf. com. His novel The Electric Boy is forth-coming with Doubleday Canada. RICHARD CUMYN is the author of eight books of short fiction, most recently Famous Last Meals (Enfield & Wizenty, 2015). His collection The Young in Their Country and Other Stories (E & W, 2010) was long-listed for the Frank O’Connor International Short Story Award. He currently lives in Edmonton. 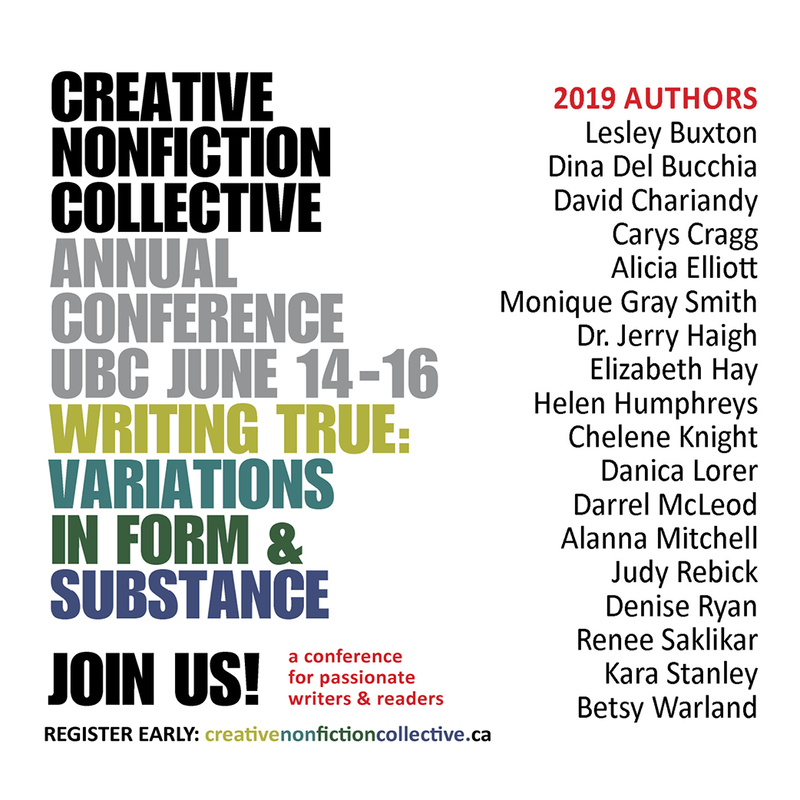 SANDRA FILIPPELLI (MFA UBC) has publications in Poetic Inquiry III: Enchantments of Place, Joyland, Trek, The Flat Earth Excavation Company: An Anthology of Surreal Fiction, The New Orphic Review and other periodicals. She lives in Vancouver, where she is pursuing a PhD in arts-based Literacy Education. LEN GASPARINI is the author of numerous books of poetry, including Collected Poems (Guernica, 2015), five short-story collections, two children’s books, a work of non-fiction and a one-act play. A poetry chapbook, Death and the Maiden, was published by Black Bile Press in 2017. PATRICK GRACE’s work has appeared or is forthcoming in Geist, PRISM international, Broken Pencil, CV2, Maisonneuve, Prairie Fire and Arc. In 2016 he was long-listed for PRISM international’s annual poetry contest and CV2’s Young Buck Poetry Prize. He currently lives in Victoria, where he works for The Malahat Review and Plenitude. BRENNA CLARKE GRAY is an instructor at Douglas College in New Westminster. Her research focuses on contemporary Canadian literature, primarily comic books, and representations of Canada in American popular media. LEAH HORLICK is the author of Riot Lung (Thistledown, 2012) and For Your Own Good (Caitlin, 2015), which was named a Stonewall Honor Book by the American Library Association. She was recently awarded the 2016 Dayne Ogilvie Prize for Emerging LGBT Writers. Originally from Saskatchewan, she now lives in Vancouver. JEFF KOCHAN is from Alberta. His work has also appeared in Exile, filling Station, PRISM international and The Windsor Review. ESTELLA C. KUCHTA’s poetry has been published in Grain, The Puritan, PRISM international, subTerrain and the Chadwick Garden Anthology of Poets. She is the editor of Breadwinner: The Life of Leo Poulos (Lulu, 2014), and is a regular contributor to ParentsCanada magazine. She has worked as a radio intern, documentary scriptwriter, editor and university instructor. EVELYN LAU is a Vancouver writer who has published 11 books, including six volumes of poetry. Her work has received the Milton Acorn Award, the Pat Lowther Award, a National Magazine Award and a Governor General’s Award nomination. She was Vancouver’s 2011–2014 Poet Laureate. Her next collection, Tumour, is forthcoming (Oolichan). ANDREW MacDONALD regularly writes reviews for EVENT. He lives in Toronto and New England, where he’s finishing a novel. ELIZABETH McCAUSLAND lives in Vancouver and teaches English at Douglas College. J.R. MCCONVEY is a Toronto writer whose stories have been short-listed for the Journey Prize, the Bristol Short Story Prize and the Matrix Lit POP Award, and appeared in The Malahat Review, Joyland, EVENT, The Puritan and elsewhere. He’s on Twitter @jrmcconvey and at jrmcconvey.com. Dr. KATHY MEZEI is Professor Emerita in the Humanities Department at SFU, and Life Member, Clare Hall, Cambridge. Her research and writing focus on the home and domestic space, modern British women writers, translation studies and Canadian and Quebec literature. She was a founding editor of the Canadian feminist journal Tessera. APRIL dela NOCHE MILNE was born in Montreal and raised in Vancouver. She attended the Fine Arts program at Langara College before completing a BFA in Illustration at Emily Carr University. Inspired by the Northwest Coast and everyday life, she is also interested in issues of gender, race and representation. CAROLYN NAKAGAWA is a Vancouver-based poet and playwright whose poems have appeared in magazines such as Room, Ricepaper, Echolocation and The Puritan. Her current play, The Girl with No Face, examines how race shapes identity in the context of art and politics in modern day Vancouver. 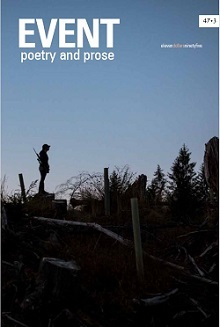 PETER NORMAN has published three poetry collections, most recently The Gun That Starts the Race (Icehouse, 2015), and a novel, Emberton (Douglas & McIntyre, 2014). The poems here are from his collection of ‘terminals’ (poems that borrow their line-ending words from other poems), forthcoming in 2018 (Buckrider Books). CHRIS OKE’s poems have appeared, or are forthcoming, in The Maynard, Existere, Dogs Singing (Salmon Poetry, 2010) and Tag: Canadian Poets at Play (Oolichan). He’s working on a collection of interconnected poems about scuba diving, Jacques Cousteau, fathers and sons. He is founding editor of Errant, an online literary travel-writing magazine (www.errantmagazine.ca). JOHN O’NEILL’s stories have recently appeared in The Antigonish Review and Prairie Fire. His story manuscript Goth Girls of Banff was a finalist in the 2014 HarperCollins/UBC Prize for Best New Fiction. He is the author of Fatal Light Awareness (Guernica, 2013), a novel. He lives in Toronto. ROB RUTTAN is a writer, teacher and photographer from Barrie, ON, who grew up in Thunder Bay. More of his work can be seen at www.saatchiart.com/rob.ruttan. TOM WAYMAN’s recent poetry titles include The Order in Which We Do Things: The Poetry of Tom Wayman (Wilfred Laurier UP, 2014). A long poem of his won the 2015 Gwendolyn MacEwan/Exile Poetry Competition. His newest short-story collection, The Shadows We Mistake for Love (Douglas & McIntyre), won the 2016 Diamond Foundation Prize for fiction. SEBASTIEN WEN is a poet, spoken-word artist and songwriter based out of Calgary and Vancouver. He is the 2014 National Underground Youth Slam Champion. His poetry has appeared in Arc, Prairie Fire and Vallum, among others. NATHAN ANDREW WILSON lives, works and writes in Toronto. He is a PhD History candidate at York University and a full-time professor at Durham College. His short stories and poems have appeared in various magazines. Recent non-fiction includes his co-edited collection: Violence, Memory, and History: Western Perceptions of Kristallnacht (Routledge, 2014).